Asbury Park, where personality practically wafts off the ocean breeze, will soon have a hotel with character to match. A derelict Salvation Army building is being transformed into The Asbury, the shore town’s first new hotel to open in more than 50 years. The youngest jewel in the crown of a multi-billion-dollar redevelopment by real-estate company iStar (NYSE: STAR), The Asbury mashes up Asbury Park’s Victorian-era history, rock-n-roll present, and shiny future into a new kind of social hub. This is not your parents’ beach hotel. A kind of fantasy vacation postcard come to life, The Asbury will create spaces like a giant rec-room lobby where adults can feel like kids again, kids can unleash their imaginations, and the outside world gets left at the door. 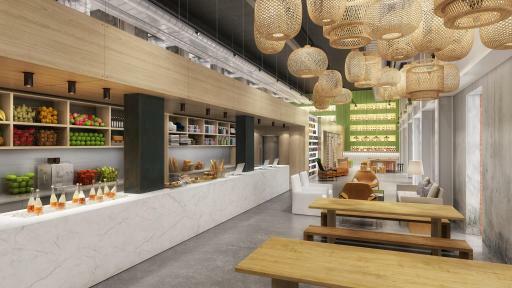 The project is a collaboration between renowned hotel innovator David Bowd, known for creating the sought-after Salt Hotels brand, and Anda Andrei, iStar’s Creative Lead for the entire Asbury Park redevelopment project, and the former design director for the Ian Schrager Company. Inside The Asbury, a happening lobby will become the action-filled center of the hotel with everything designed for perpetual motion. 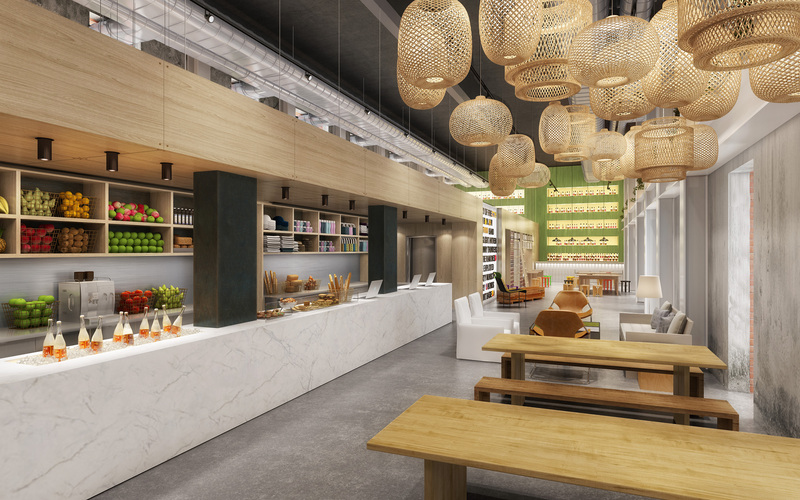 The front desk and check-in will double as The Counter, a grab-and-go kitchen where guests can fetch keys, order coffee, or buy something from the retail store. A ground-floor lounge will become Asbury Park’s rec room, with ping-pong, pinball machines, board games - and a communal table for travelers who want to feed off the energy and get some work done. Upstairs, the 110-guest rooms will come in an unusually wide range of sizes to suit all kinds of travelers, from queen rooms and king rooms to family rooms and suites to bunk rooms that can sleep up to eight. The essence of the rooms will be simple, clean, and functional, but with many thoughtful touches—bathrooms light and bright, huge closets, custom made mattresses with great linens. Black-and-white beach and music scenes will adorn the walls, along with classic music posters that reflect Asbury Park’s rock-laden past and spectacular sea-side views. Inspired by Central Park’s Great Lawn, The Baronet will feel like nothing else in Asbury Park—or anywhere. A rooftop garden featuring stunning town and ocean views, guests will be able to throw down a blanket and lay with a book or enjoy the oversized games and paddling pools. By night, The Baronet will become a carless “drive-in” with classic and cult films projected on a 20-foot wall. The Pool will be a sanctuary for guests. With plentiful seating and a large pool deck, guests can take a dip, soak in the sun, or grab a drink at the bar. On Sundays, the pool will be open to the public for a pool party featuring local DJs and specialty cocktails. Food and beer trucks in the Beergarden – adjacent to the Asbury’s outdoor pool – will serve authentic street food, craft and local beers, and signature drinks. The Beergarden will be a fun and relaxed meeting place for locals and guests to grab a bite. Salvation, designed solely in black and white and located on the hotel’s upper roof, will become the East Coast’s most dramatic outdoor social space. The monochrome décor, lit only by candles and lanterns, will also make it the most romantic with cozy corners to hide away or relax. At nearly 4,000 square feet, the lounge will seduce with beds and lounge areas with spectacular sunset views of the ocean and the city. Renowned local DJs and celebrity artists will rock the house nightly. At Soundbooth, a casual lobby bar, hotel guests can hang with local creatives over cocktails, games and nighttime music sets. Even meeting spaces will be different. Asbury Hall & Lawn is a 4,800-square-foot, flexible indoor/outdoor event space unlike any other on the Jersey Shore. Elegantly designed, with the most advanced AV equipment and divisible into two or three smaller spaces, The Hall will serve social and corporate gatherings of all sizes. Stonehill & Taylor Architects, known for game-changing adaptive reuse projects like Manhattan’s Ace and NoMad hotels, oversaw The Asbury’s transformation. Bonetti Kozerski Studio, whose clean, understated interiors have won fans like André Balazs and Donna Karan, designed The Asbury’s “bungalow-on-the-beach” guest rooms. The Asbury is located at 210 5th Avenue, Asbury Park, just two blocks from the beach and buzz of the Asbury Park Boardwalk. Rooms are expected to start at $125 per night. iStar (NYSE: STAR) finances, invests in and develops real estate and real estate related projects as an adaptive investment company, bringing uncommon capabilities and new ways of thinking to commercial real estate. Building on more than $35 billion of transactions, including $10 billion of residential projects over the past two decades, iStar is one of the largest investors in luxury condominium, multifamily and master-planned residential developments in the U.S. Structured as a real estate investment trust (“REIT”), its portfolio is diversified by asset type, property type, geography and obligor, with a focus on larger assets located in major metropolitan markets. Additional information on iStar is available on the Company's website at www.iStar.com.